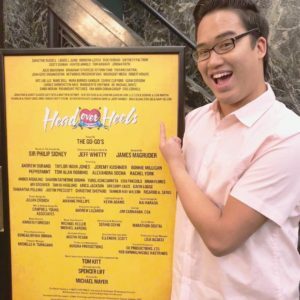 CampBroadway / BlogPost / CB Alumni Eric Gelb, making Broadway producing debut with Head Over Heels and directing Legally Blonde at NYU! CB Alumni Eric Gelb, making Broadway producing debut with Head Over Heels and directing Legally Blonde at NYU! Our very own Eric Gelb is getting into the producing/directing game… BIG TIME! Eric was a former blogger and editor for Camp Broadway, who now attends NYU’s Steinhardt School for Culture, Education, and Human Development for educational theatre. He is currently Co-Producer of Broadway’s Head Over Heels and directing NYU’s Legally Blonde the Musical… and we couldn’t be more proud! I was able to catch up with Eric and talk with him about his motivation and passion for directing and producing. Stay tuned for an exciting review about both shows! In the meantime, follow the links below for more information. When you were younger, how did you get started as a Camp Broadway blogger? Did you take any classes or attend any events with CB? I grew up with an incredible theatre community at a local community arts organization – Project DayDream, Inc. A theatre mom had tagged me in a call looking for bloggers and I applied and started first as a blogger and eventually became an Editor, working closely with talented young writers across the nation. It’s an experience that helped me grow immensely in taking initiative, being responsible and continually creating content for a growing audience. What was one of the most memorable blogs or experiences that you have had with Camp Broadway? My senior year of high school was my final year with Camp Broadway and it was a huge transitional time with me. Something I loved about CB was I always felt like I had an anchor to NYC. I came back and forth to NYC to visit schools, and Kerry, my advisor, invited me to visit the CB offices. It was my first “NYC meeting” ever in a fancy office in Midtown, and I got to meet the people who make CB happen and got to hand deliver my portfolio to the staff and talk to them about my future with CB (which is happening soon, I promise!). It was so cool and a milestone for me — and confirmed that I wanted to come to NYC. When did you decide that you wanted to become a producer and what sparked this interest? I’ve wanted to produce ever since I was little – I co-produced my first musical when I was 13 (long story…) and I loved the control I had to help find the venue, the team, the performers, pulling it all together. It’s a very unique role where you get to see and interact with so much that makes the job what it is. What does your job as a producer entail? Getting the money to make the show happen. What was your very first producing experience? I was unsatisfied with the opportunities that my town had for young people who didn’t want to be onstage. My best friend wrote a musical when we were 13 and I co-produced it with him. It was the best. How did you get the opportunity to co-produce Head Over Heels? I’m part of a producing initiative that helps underrepresented groups break into the Broadway community! My work on the show started in May and continued until the show opened. What sparked your passion for directing, what do you love about it? I fell into it. I knew I wanted to work offstage, and through my work as a general intern at a Performing Arts Education and Entertainment company, I found I liked being in charge and cleaning up moments in the show. What do I love about it? Directing is a high personal experience. I like getting to know people through the method in which they perform and watching them grow and building that relationship of trust. It’s very special. What does your job as a director entail? I block the show. Who comes on when, who leaves when, why they do it and how they do it. I take care of transitions, how we move from scene to scene and the tone of the show, which influences everything else – the set, costumes, lights. etc. Is Legally Blonde your first directing experience? How did you get the opportunity to direct this show? This is my first time directing on my own, but I’ve assistant directed and student directed and co-directd before. 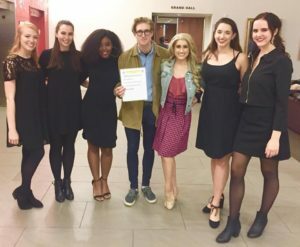 I’m on the board of a club here at school, Lamplighters NYU which creates free theatre for young audiences in NYC, and was given the opportunity to propose a show and direct it to the board. My friend Victoria suggested my favorite show of all time, Legally Blonde the Musical. And here we are! How do you balance your NYU schoolwork with your job as a director/producer for both Legally Blonde the Musical and Head Over Heels? Passion. The love for the work makes the 2am work nights better. Seriously. What are some differences and similarities when working on NYU’s Legally Blonde the Musical and Broadway’s Head Over Heels? They both are the same in terms of reputation. Both very high profile shows that people have high expectations for and you have to wow them not only in the show, but in the PR and the other stuff that comes with it. Differences, Legally Blonde already existed in the world and it was my job as a director to figure out how we can tear it apart to make it worthy of being produced in 2018, and Head Over Heels’ story is completely original, with allows for a little more flexibility creatively. Thank you to Eric for being so gracious and taking the time to speak to our readers! We all enjoy a little inside scoop and glimpse into the theatre world in New York City. I can’t wait to see both shows and tell you all about them!